It was a grey morning on the 13/05/2017… The weather report was promising wind and rain… It did not bode well for a band of Hams wanting to transmit from a windmill on a hill in Derbyshire. 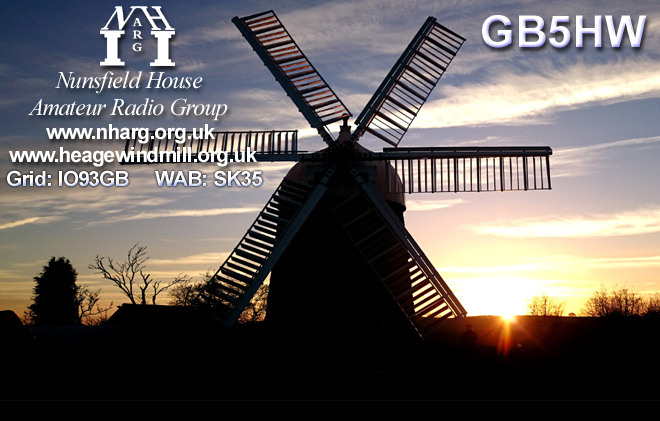 The Nunsfield House Amateur Radio Group have been transmitting from Heage Windmill in Derbyshire since 2003 and have not missed a Windmills On The Air event since! The callsign used here was GB5HW. This year they had a number of new members on the radios as well as the long time members. The weather steadily improved and by 1430 on the Sunday, the group were gasping for a cup of tea, throats were parched, there had been 25 stations contacted on 2m since the morning and the poor operator who had taken the brunt of the pile up was desperate for the loo! The group operated on 2m, 20m, 40m and 80m and although band conditions were not ideal, the inter G contacts made it very difficult to reach many mills. We did however manage 12 over the course of the weekend. The best contact over the weekend was made by Connor (M6HZH) who managed to get all the way to Russia! Please note this was not a Mill contact. The group would like to thank all of their 107 contacts over the weekend who all took the time to give full reports. It really was appreciated.